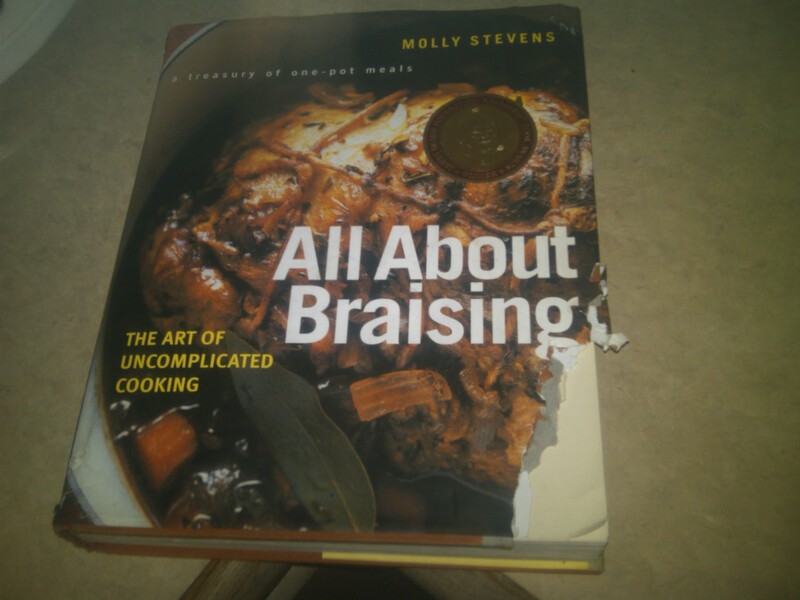 One of my all-time favorite cookbooks is Molly Stevens’ All About Braising: The Art of Uncomplicated Cooking. My mother introduced me to this cookbook a few years ago and I snatched it up at our favorite discount bookstore up in the mountains. As you can see (take a look at the lower right-hand corner) Jewels loves this book as well. She’s not normally a chewer but I must have had some meaty remnants on the pages and who can resist that? Anyway, I’ve made a few recipes in this cookbook, but my go to crowd pleaser has always been the Red Wine Braised Short Ribs with Rosemary and Porcini (p. 241 if you have the book.) This is one of those dishes that just has winter written all over it. I’ll usually serve it over noodles or mashed potatoes and finish the night with clean bowls and happy bellies. On the other hand, sometimes I feel like I’m stuck in a rut and will never make short ribs any other way. For that reason, I decided to be adventurous and do some summertime cooking–grilled short ribs. I got them from my butcher, Harry Ochs at the Reading Terminal, and went home with all intentions to grill. As I puttered around the kitchen on Monday (after doing some preliminary research online) I started getting nervous about making grilled short ribs. I consider myself a beef short rib aficionado–what will happen if I don’t grill them correctly? 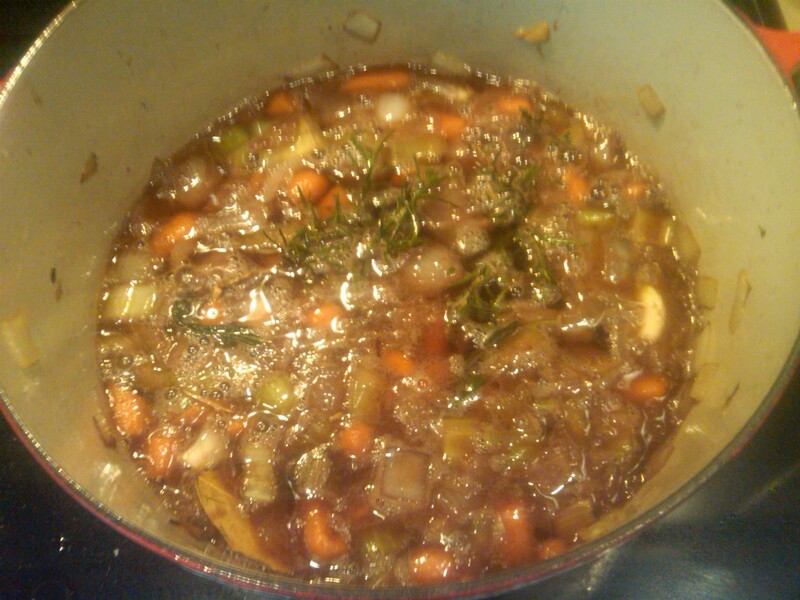 My fears overcame me and I decided to do another version of the braise. 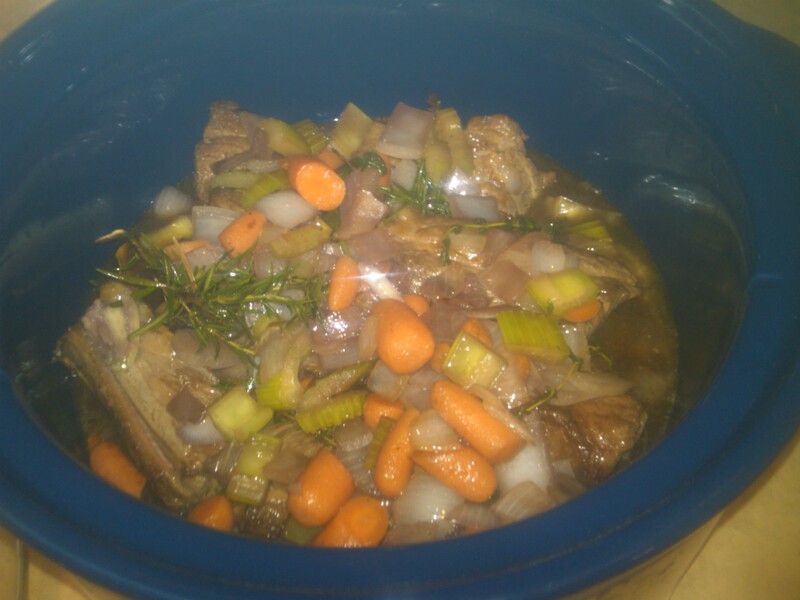 I tooled around the internet a bit and decided that I’d do a beer braise in the crockpot. 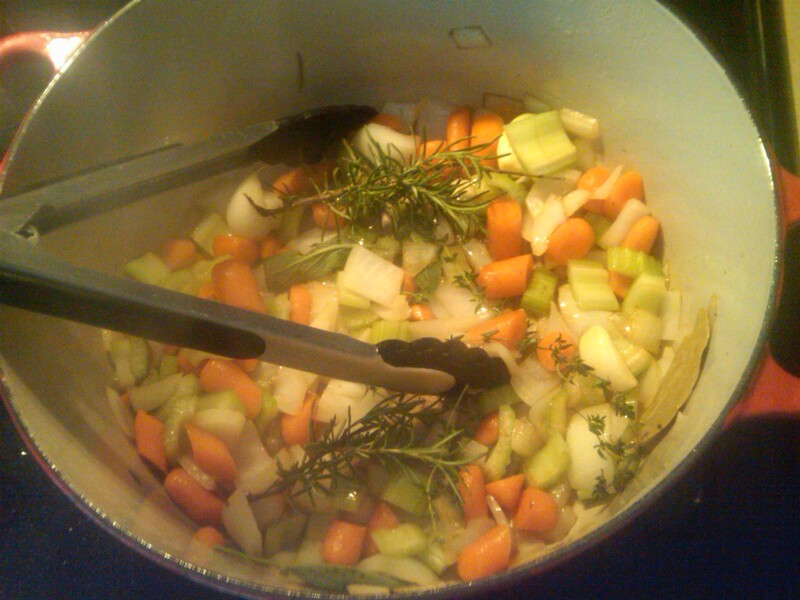 It is TOO HOT to have a braise going in the oven these days. Remember that time I mentioned my inability/refusal to follow recipes? This is a perfect example. This is the best example of a recipe that you’ll get from me. Molly Stevens told me that short ribs would benefit from 24 hours of light salting, so I laid them in a pyrex lasagna dish and brushed them with a light dusting of salt the day before I started my preparation. This is an optional step. I began my browning the ribs in the olive oil. When they were sufficiently browned (5 minutes, give or take) I tossed them into the crock pot and added the chopped veggies (carrots, onion, celery) and garlic to the pot. I forgot to take a picture of the browning meat. See, I’m new to this whole blogging thing. After a minute or two, I added the herbs and bay leaf. After giving the veggies another two minutes to soften, I added a splash of red wine and scraped the brown (delicious) bits from the bottom of the pot. I let the wine reduce, and added a bottle of lager. Every recipe that I saw was for “porter braised short ribs” but guess what? I didn’t have any porter so lager was going to have to do the job. I let the mixture bubble away for another minute or so, cooking away all of the alcohol. 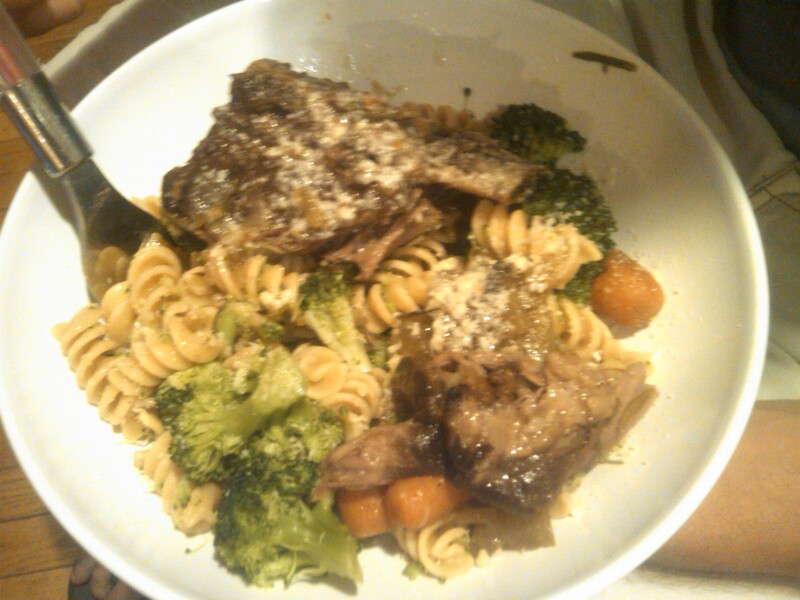 Then I poured it on top of the browned short ribs and set my crockpot on low. I cooked the ribs for about 7-8 hours on low and then let them cool to room temperature. These ribs, like other braises, soups and stews, tend to taste even better a day or two after cooking as the flavors have time to settle and develop a richness. We tossed it in the fridge for dinner the next night which was perfect because I was having drinks with a dear friend for her 29th birthday and wouldn’t be home until later that evening. When it was time to cook them, my husband skimmed the fat off the top (hmmm…what to do with that tastiness sitting in my fridge…) and set the crockpot on low for an hour or so. I had hoped to make gnocchi or fresh pasta to go with the ribs but realized that I had none of the ingredients for either, so we settled for boxed whole wheat rotini (ah, my love hate relationship with whole wheat pasta. I’m trying to like it; really I am.) and broccoli. The result? Fall-off-the-bone-goodness with the rich meat flavor and the subtle lager lingering in the background. Verdict? I think I prefer the red wine braise but this was much less labor intensive and let’s just say I cleaned my plate anyway!